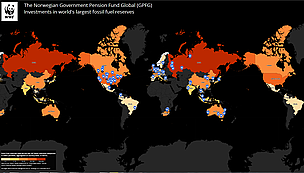 The world’s largest sovereign wealth fund - the Norwegian Government Pension Fund Global (GPFG) - is invested in 147 of the world’s 200 companies holding the largest reserves in coal, oil and gas. The fund’s share of those reserves is equivalent to 108 times Norway’s annual greenhouse gas emissions, according to a new analysis from WWF. The fund is currently invested in more fossil fuels than can ever be burned if we are to avoid catastrophic climate change. The London-based think tank, the Carbon Tracker Initiative, recently released a report listing the 200 companies in the world with the largest fossil fuel reserves. WWF has analyzed Norway’s investments in this list of companies through the GPFG. The fund has invested US$37 billion [or 10% of the fund's equity investments] in 147 of the world’s 200 most carbon-rich companies. These investments alone are in fossil fuel reserves would produce 14% more CO2 than can be released globally if we are to maintain an 80% chance to limit global warming to 2 degrees Celsius. 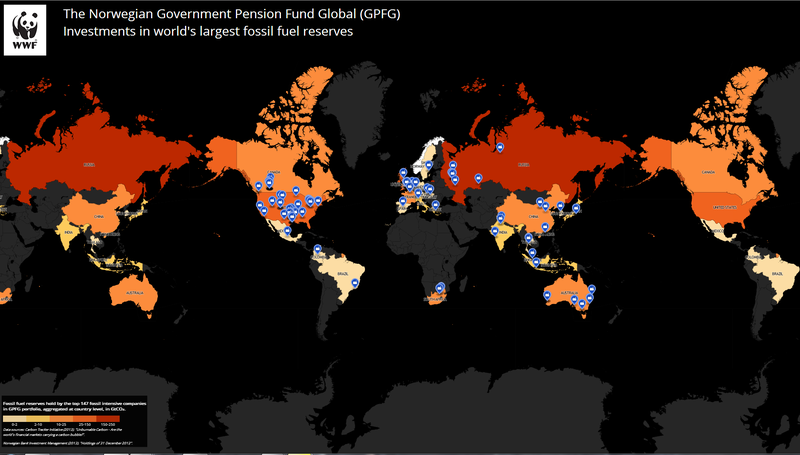 WWF has calculated that the fund's fossil reserves ownership is 5.83 Gt CO2. This is equivalent to 108 times Norway’s total greenhouse gas emissions in 2010. WWF believes that the Norwegian pension fund must move investments out of companies significantly contributing to concentrations of greenhouse gases – and into companies that develop sustainable renewable energy. WWF calls on the Norwegian Parliament to give the fund a mandate to invest 5 percent of the portfolio in renewable energy. With investments in 7,000 companies - and as an owner of 1.2% of the world's stock markets - Norway is the world's largest state investor. The fund has been built on large state oil revenues, and is now re-invested in bonds, real estate and stocks. “The Norwegian Ministry of Finance argues that the Fund must invest a little in all companies because the size of the country’s wealth is so huge. But this is a counter-productive contribution to sustainable development and also a financial risk to Norway,” says Mangset. State Secretary Hilde Singsaas of the Norwegian Finance Ministry said today that they have taken into account issues and risks related to investments in fossil fuels. “Reducing investments in oil and gas has been debated on several occasions. We conducted an assessment in 2009 that showed it was likely of little importance for aggregate risk whether or not we removed investments from companies in the oil and gas. The most important thing we do to reduce risk associated with the value of stocks is to re-direct economic resources from the oil sector on the Norwegian continental shelf to ownership in companies world-wide, but it is natural to ask the question from one time to another, and that we will continue to do in the future. Our concern for climate change is expressed in different ways, like investing in environmentally friendly technologies in line with the recommendations presented by the Mercer report. When it comes to increasing the fund’s investments in renewable energy, we will evaluate this after we will have gained experience with investments in real estate**,” says Singsaas. *Note: In 2011 the fund has started to invest in real estate, working towards a target of 5%. This is a new mandate given to the fund’s management, and WWF’s proposal to invest in renewable energy follows the same logic.